The streets of Ferguson have calmed, children are heading back to school and residents are honoring Michael Brown’s family's wish for peace. But now a legal battle looms over whether Ferguson police Officer Darren Wilson was justified in shooting and killing the unarmed teenager. Chris Cuomo hosted a Facebook chat on Tuesday to address your questions on the case. Q: Imarah – Guilty or not guilty, Do you not think six shoots is way overboard and also why the head or a fatal shoot, do they not teach them in the police academy ways to injure or slow down without killing? I think it should be mandatory that all police officers wear cam for both our protection and theirs as it will enable better transparency. What do u think? A: Chris Cuomo the number of shots is a tricky part of the analysis. it always is in cases like this. the primary analysis is whether shooting was necessary at all. 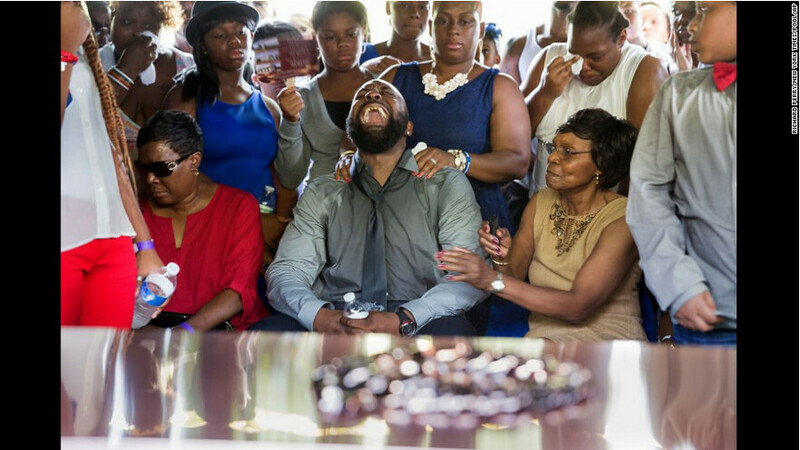 Q: Anna – If officer Wilson is charged with murder, who pays the legal fees? A: Chris Cuomo Elisabeth – this is a natural instinct that I think fails to be helpful here. And here is why: we do not know whether the officer was responding to the robbery, and it does not seem that he was. the past therefore is only relevant as a measure of potential reaction to the actual altercation and shooting that occurred. Facebook isn't the only social network that experiments on its users. Online dating site OkCupid revealed on Monday the results of a study it conducted, in which it told subscribers they were more compatible than they really were. The result? There's something to the power of suggestion. OkCupid, which is owned by Internet conglomerateIAC (IACI), gives its users a compatibility score based on how they answer a series of questions on the site. Among users who were just 30% compatible, a single message from one OKCupid subscriber to another led to a conversation only 10% of the time. But here's the twist: when OkCupid duped users who actually had low compatibility, telling them that their compatibility score was 90%, they had a 17% chance of having an online conversation. The experiment worked in the other direction as well. That is, when users with 90% compatibility were told that their compatibility figure was only 30%, the likelihood of a conversation dropped from 20% to 16%. 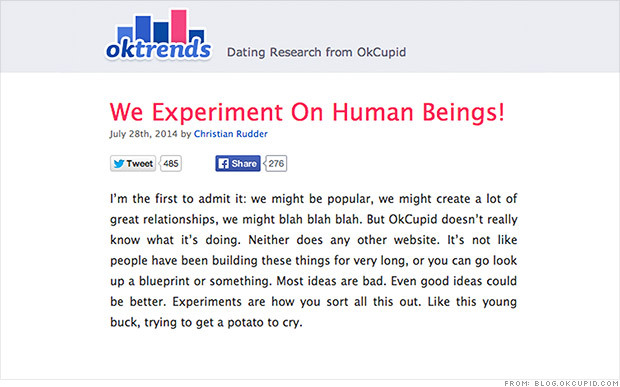 OkCupid's results come after Facebook (FB, Tech30) caused a stir in June by revealing that it had changed the content mix in the News Feeds of almost 700,000 users in early 2012. Some people were shown a higher number of positive posts, while others were shown more negative posts. Hurricane Arthur continues to dampen Fourth of July plans along much of the East Coast this morning. Along with our team coverage from Indra Petersons and Alina Machado, we’ve seen a lot of amazing photos and videos coming in from you over social media and CNN’s iReport. These photos were snapped by Michael Chorey out of Oak Island, North Carolina, yesterday afternoon as Arthur began to approach. Michael is vacationing from Columbus, Ohio, for the holiday weekend. He also reported hearing tornado sirens sounding shortly after taking these images on the beach. We'd love for you to keep sharing your photos and videos, but please stay safe. Go to iReport to submit the best of what you are seeing.